Walter is a Partner at Oraro & Company Advocates. He heads the commercial litigation practice area. 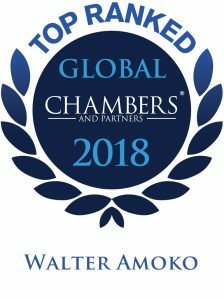 With over 20 years of experience, Walter has represented local and international clients in administrative law & judicial review, highly complex banking and commercial disputes, constitutional law, employment and labour disputes, environmental disputes and tax disputes. 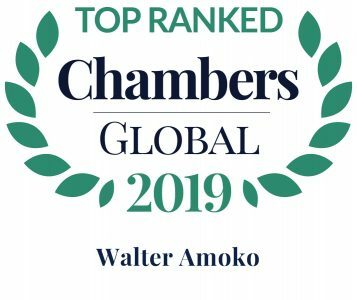 The Chambers Global 2019 Guide ranked Walter as a band one lawyer for his Employment & Labour practice with the directory commenting that "He's top tier for the high calibre of disputes that he handles and his preparation," "quick on his feet" and "extremely bright." Walter was also recognised as a band two lawyer in dispute resolution with the directory noting that "He's excellent on his feet in court. He's a very fine lawyer, even in his paperwork." Walter has a has a Bachelor of Laws (LLB) from the London School of Economics and Political Science, United Kingdom and a Diploma in Law from the Kenya School of Law. Successfully represented Moi University in a suit challenging the decision by the Council of Legal Education to close its School of Law. Matter currently on appeal. Acted for a developer in a multi-billion claim over a repudiated contract for the purchase of six blocks. The award in favour of the developer was subsequently set aside on appeal. Successfully represented Kenya Deposit Insurance Corporation against the proposed sale of part of Chase Bank to SMB. Successfully represented one of the leading banks in a claim for damages for alleged wrongful reporting of one of their customers to a Credit Reference Bureau. Advised and negotiated a settlement for Communications Authority of Kenya with its main contractor and sub-contractors in respect to a claim relating to the construction of its headquarters. Representing Standard Chartered Bank in a case involving alleged wrongful dismissal and malicious prosecution. The claim USD 6,000 excluding interest. Successfully represented the Grove Limited before the National Environmental Tribunal and the Environmental and Land Court in an appeal challenging the EIA licence granted to them by the National Environmental Tribunal for a 987-acre mixed-use development. Successfully acted in a consortium for Hyundai and Toyota in relation to winning a KenGen tender for the construction and generation of a geothermal power plant at Olkaria off the Naivasha-Nakuru highway. Arbitration: A Time to Rethink?